The firetrucks were having difficulty getting to the scene amid the daily afternoon rush hour traffic. 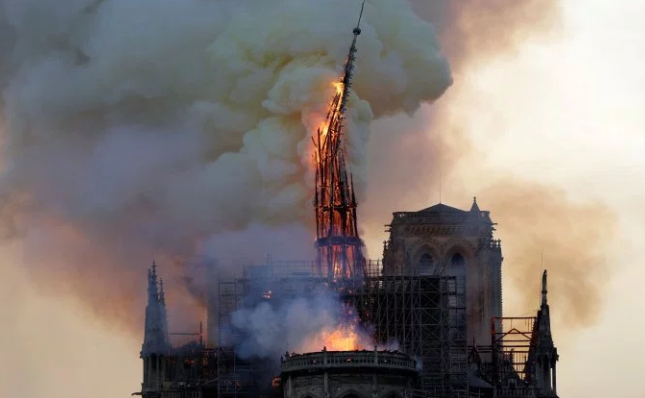 Paris Mayor Anne Hidalgo said the fire brigade is trying to control a “terrible fire” that’s broken out at Notre Dame Cathedral. The medieval cathedral was completed in the 13th century and today, with its towers, spire, flying buttresses and stained glass, is considered a feat of architecture as much as a religious symbol. It is one of Paris’ most popular attractions, drawing an estimated 13 million visitors a year. It is not known at this time how or why the fire started and there has been no report as of yet on any injuries or casualties.